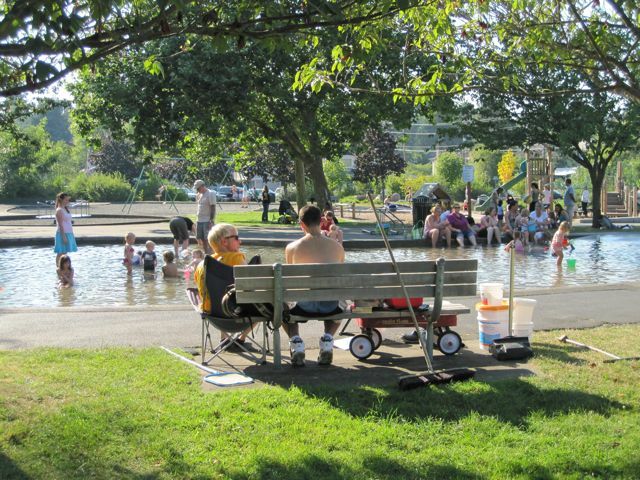 Wading pool season opens on Saturday! Yay! AND, YES, IT’S ALMOST WADING POOL TIME. Wading pools are open when the temperature is forecast to be 70°F or higher. Sprayparks, however, are open daily (unless thunder and lightning are present). You can download the full Seattle Parks and Recreation wading pool, spraypark, and swimming beach schedule here (in all its Comic Sans glory; 302 KB PDF). Everybody into the [wading] pool, before it closes! It’s August, and Seattle summer is chugging right along: Lots of sun, temperatures consistently in the mid- to upper-70s…this time of year is why we live here. So, naturally, the city’s wading pools are all preparing to close for the season. At this time, NE Seattle does not have any of the unstaffed sprayparks, which tend to stay open later in the season. However, Sarah (raintea on twitter) would like us to mention the brand new spraypark at Northacres Park (12718 1st Ave NE). It’s open daily from 11 AM – 8 PM through September 3. It is technically in Seattle Parks and Recreation’s NW geographic area, but when you and the kids are too hot, who cares. You can find the full list of Seattle’s wading pools, sprayparks, summer beaches and pools and their schedules right here (280 KB PDF; comic sans).